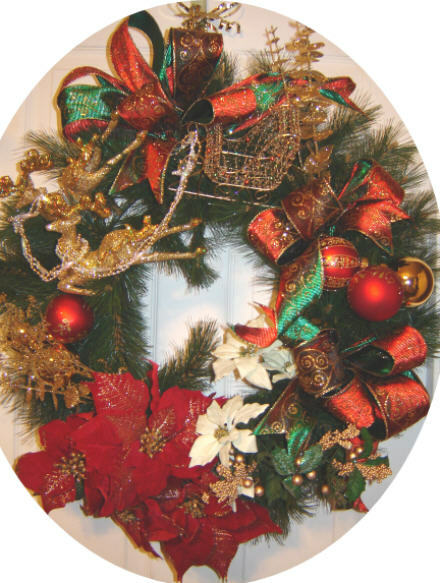 Royal Christmas Wreaths has a variety of themed wreaths from traditional to nautical using beautiful ribbons, ornaments, and unusual hard to find decorations to make our wreaths outstanding and a thing to cherish forever. 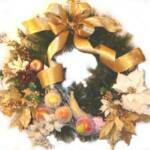 For choices of Holiday wreaths, information and pricing see below. 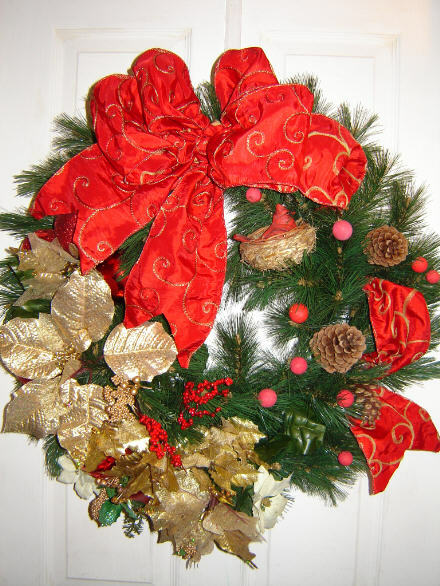 See below for pictures of wreaths and to "order now". Very important**Please note if the exact design ribbon or ornament as shown here is not available at time of order, we reserve the right to replace it with a similar likeness of the same or higher quality. We will advise you if the exact or similar items are not available at time of order. You have the right to accept or not accept the replacement item or get a full refund prior to shipment. 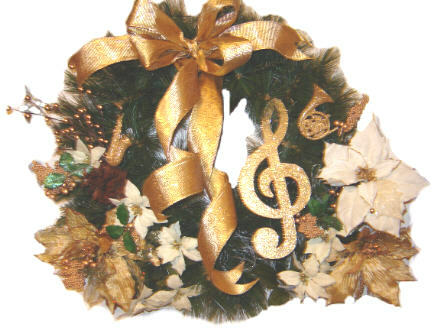 Once shipped the wreath is nonrefundable. SELECT "FREE" at check out for no additional charge for 5-7 day ground shipping which is included in the price. 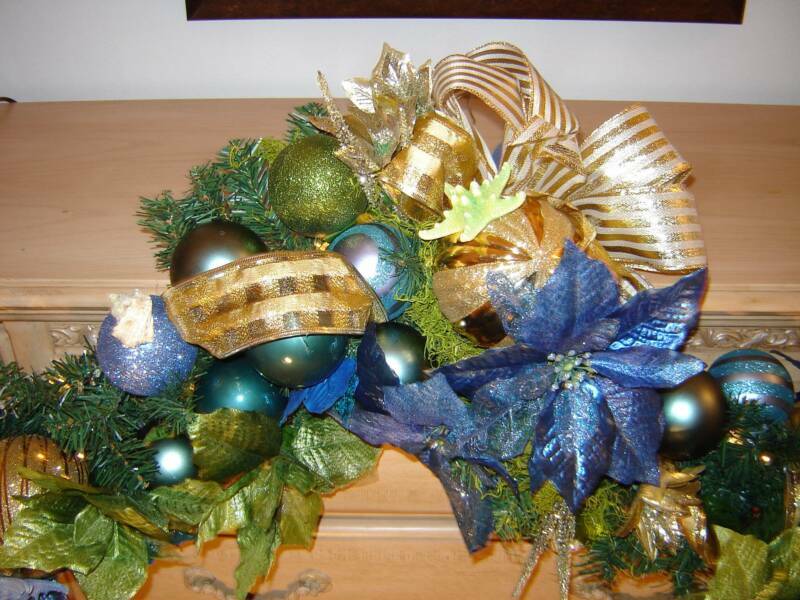 Please note all our centerpieces, wreaths and trees are made to order, so if you desire anything custom or want to make a special request, you have only to send us an email. 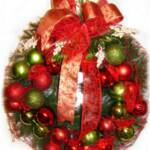 Contact us with Special requests, questions or changes regarding Christmas wreaths. 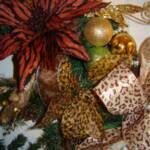 Centerpieces, Tree Skirts and Table Cloths can also be made to order. Contact us for a quote for your theme. 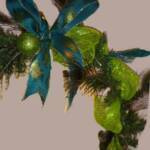 Wreaths have electric lights unless you choose the new battery operated option stated below. NEW! NO ELECTRICITY NEEDED. 24 inch Wreath With Clear LED Lights and Light Sensor. 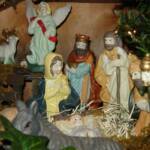 A Great Decorative Accessory to any Christmas Decoration. Lights Turn On Automatically when it gets dark. Battery powered with two AA Batteries. Super bright Led Lights Save 90% power compared to regular lights. 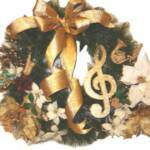 If you add this to your order you will receive the battery operated wreath that you can hang anywhere without the need for electricity. Click the "battery button" to add this feature. $30 will be added to your order. Click here to add this feature and then add the decorated wreath of your choice below. Pine Wreath 24 inches, decorated in Copper, Gold, Burgundy, Leopard print and Sage. 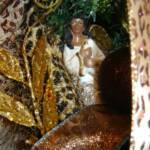 Ornaments include bird, crystal encrusted fruit ornaments, silk flowers and bows. 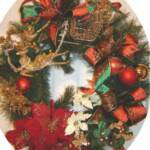 Wreath has electric lights unless you choose the battery powered featured above for an additional $30. Gold over-the-door hanger also included. 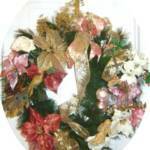 Needle Pine 30 inch wreath, Victorian Pink, Gold and White. Ornaments include peacock, ball ornaments, Angel and bows. Wreath has electric lights. Gold over-the-door hanger also included. (within the continental USA) SELECT "FREE" at check out for no additional charge for 5-7 day ground shipping which is included in the price. 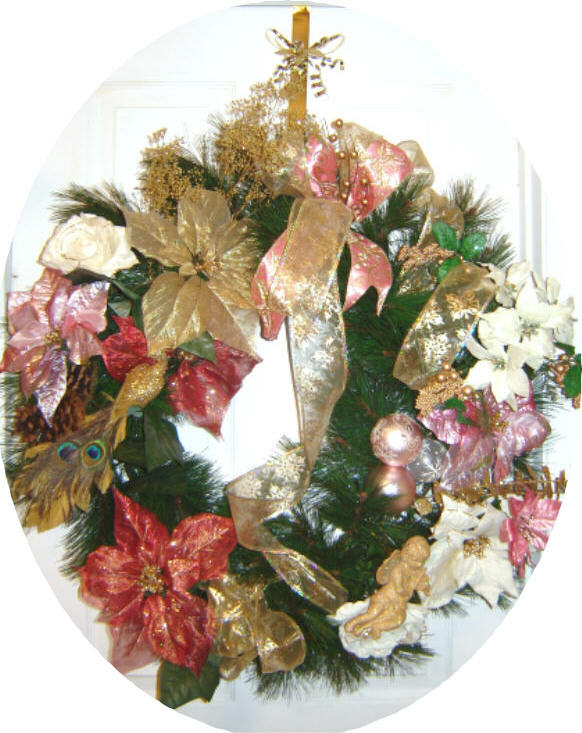 Needle Pine 24 inch Wreath decorated in Victorian Pink, Gold and White. Ornaments include peacock, ball ornaments, bows and Angel. Wreath has electric lights unless you choose the battery powered feature above for an additional $30. Gold over-the-door hanger also included. If you have questions about placing an order. 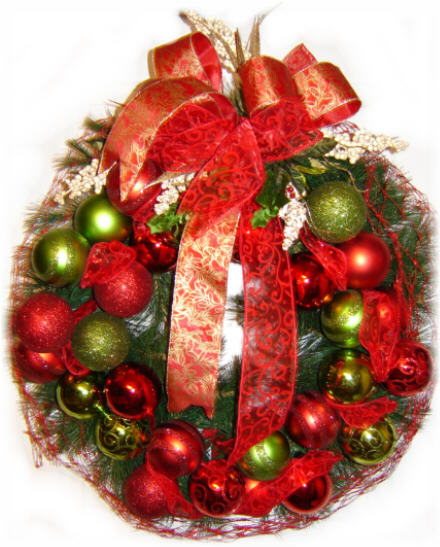 Needle Pine 24 inch Wreath decorated in Traditional Red, Gold, Green and White. 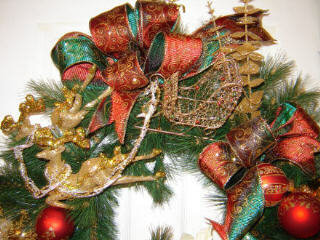 Ornaments include reindeer and sleigh. 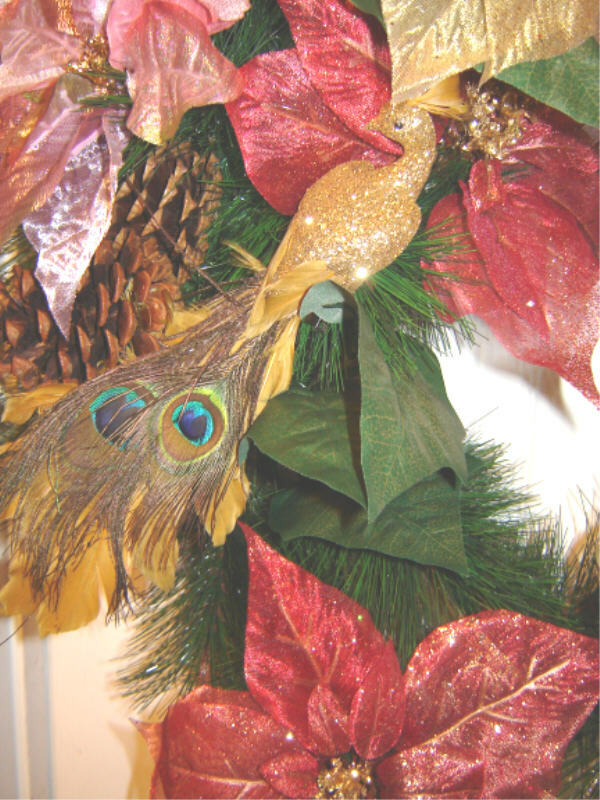 (If Reindeer is sold out at time of order, we will include a red and gold peacock similar to the one in the Victorian wreath above.) Ball ornaments and bows also included. Wreath has electric lights unless you choose the battery powered feature above for an additional $30. Gold over-the-door hanger also included. 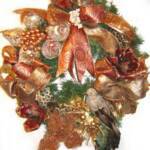 Needle Pine 24 inch Wreath decorated in Traditional Red, Gold and White. 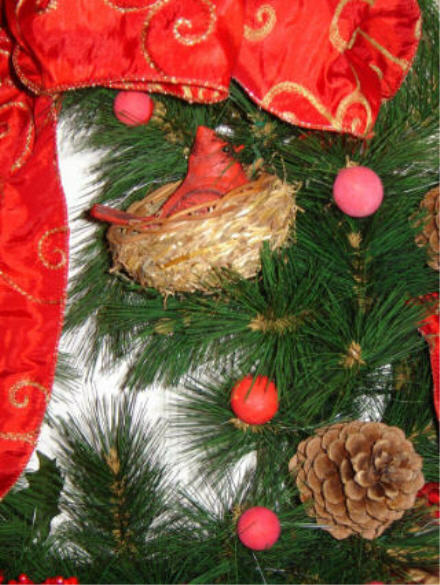 Ornaments include a bird in a nest, ball ornaments and bows. Wreath has electric lights unless you choose the battery powered feature above for an additional $30. Clear over-the-door hanger also included. SELECT "FREE" at check out for no additional charge for 5-7 day ground shipping which is included in the price. 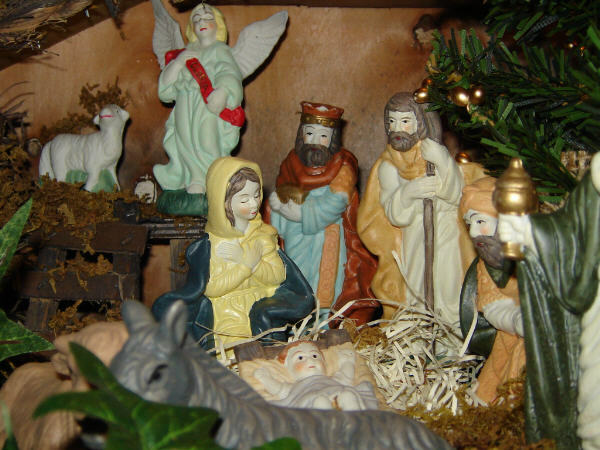 Nativity Scene Centerpiece is constructed on a 24 inch Twig wreath base. It has a single electric candle. If you prefer a battery operated candle please let us know. $129.00 including 5-7 day ground shipping (within the continental USA) SELECT "FREE" at check out for no additional charge for 5-7 day ground shipping which is included in the price. 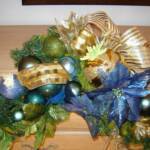 Pine 24 inch Wreath decorated in aqua and azure blues, green, gold and white. 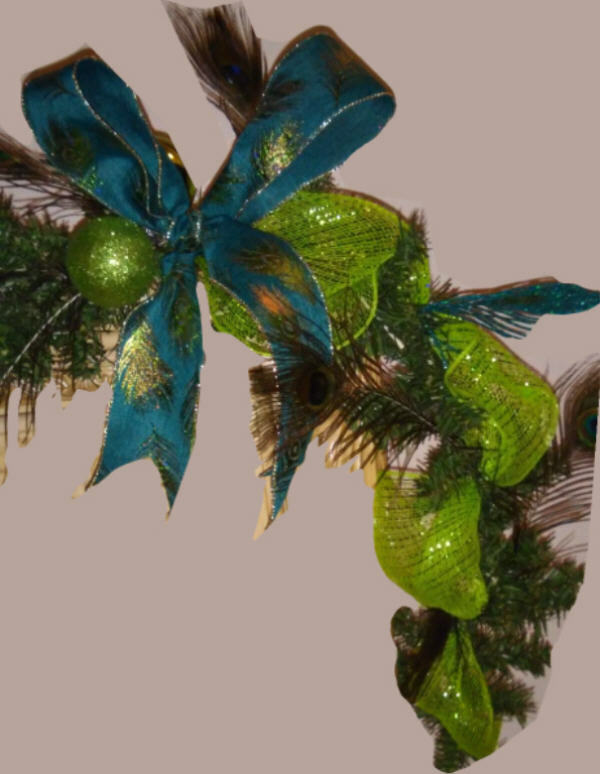 Ornaments include peacocks, butterflies, ball ornaments, silk flowers and bows. 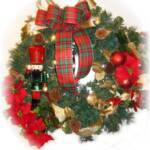 Wreath has electric lights unless you choose the battery powered featured above for an additional $30. Gold over-the-door hanger also included. 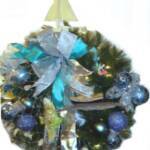 Pine 24 inch Wreath decorated in aqua and azure blues. 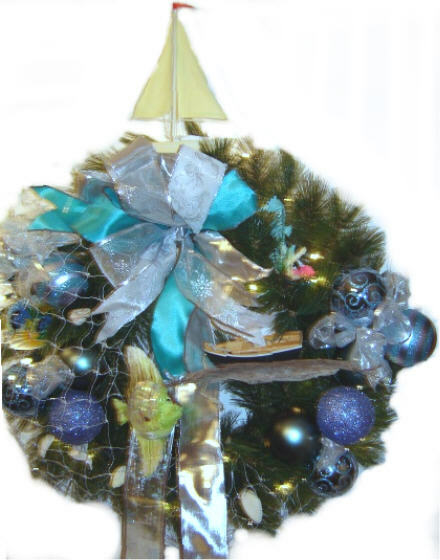 Ornaments include fish, seahorse, seashells, driftwood, sail boat, fishing boat, ball ornaments, silk netting and satin bows. 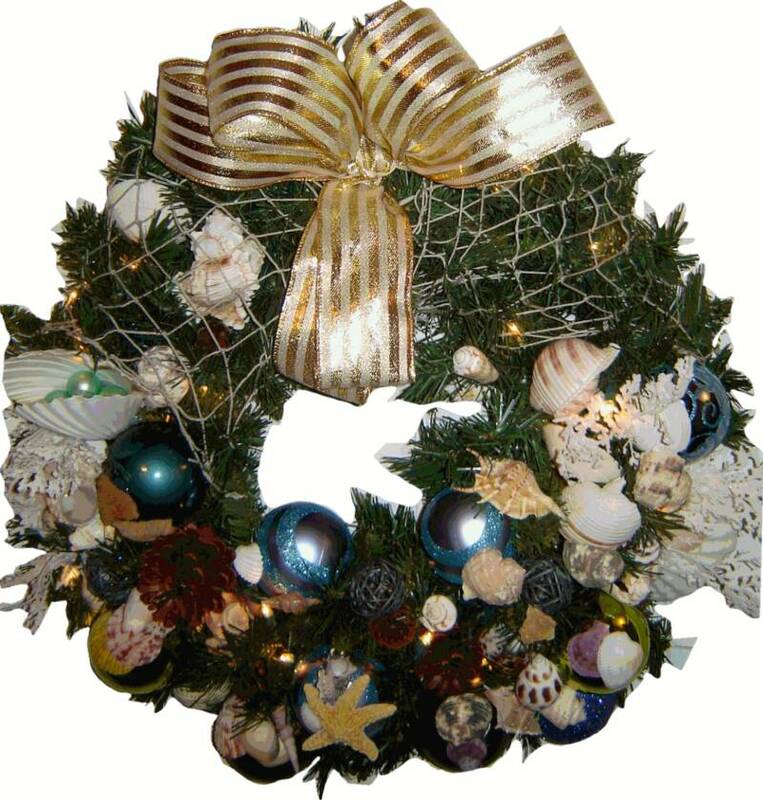 Wreath has electric lights unless you choose the battery powered featured above for an additional $30. Gold over-the-door hanger also included. 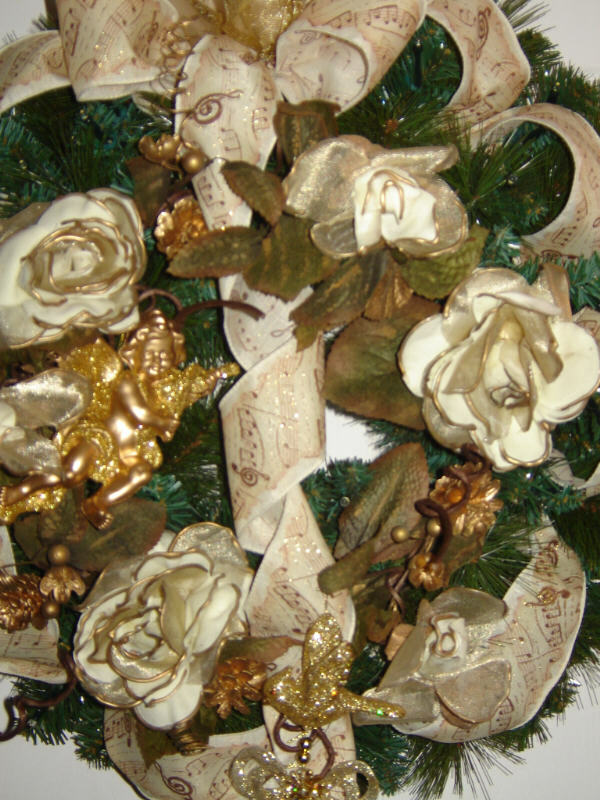 Pine 24 inch Wreath decorated in creme and gold, gilt edged roses and gold cherubs. 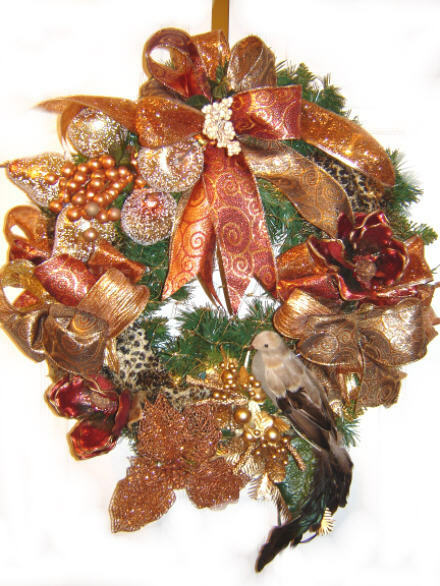 Ornaments include bird, ribbon with musical notes, silk flowers and bows. 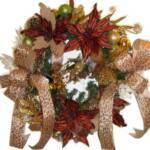 Wreath has electric lights unless you choose the battery powered featured above for an additional $30. Clear over-the-door hanger also included. $149.00 includes 5-7 day ground shipping (within the continental USA) SELECT "FREE" at check out for no additional charge for 5-7 day ground shipping which is included in the price. 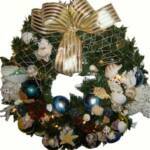 Pine 24 inch Wreath decorated with real seashells and other ornaments. 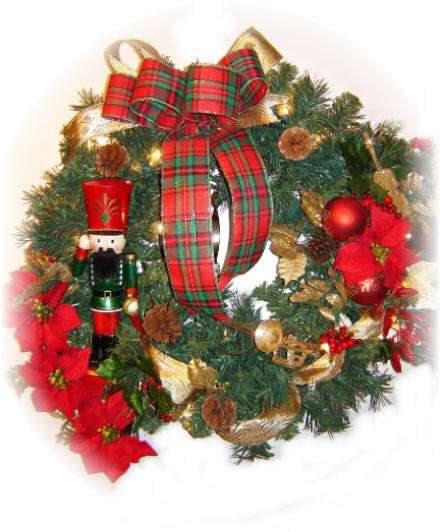 Wreath has electric lights unless you choose the battery powered featured above for an additional $30. Gold over-the-door hanger also included. 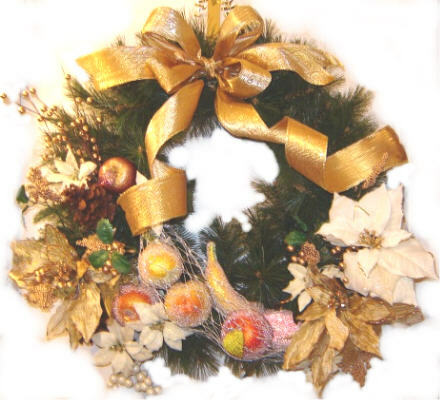 Pine 24 inch Wreath decorated in creme and gold, and gold cherubs. 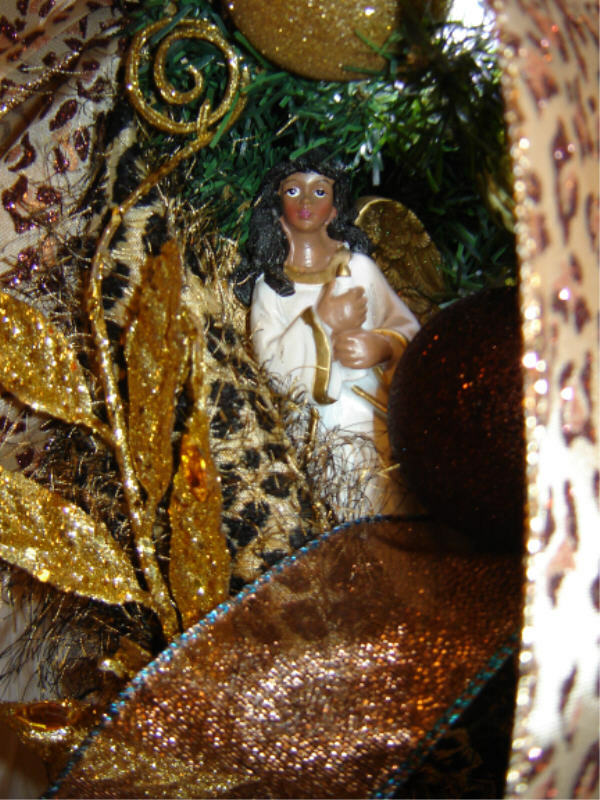 Ornaments include wooden and ceramic Nativity Scene, gold angel and cherubs, ribbon with musical notes, silk flowers and bows. Wreath has electric lights unless you choose the battery powered featured above for an additional $30. Clear over-the-door hanger also included. $99.00 includes 5-7 day ground shipping (within the continental USA) SELECT "FREE" at check out for no additional charge for 5-7 day ground shipping which is included in the price. 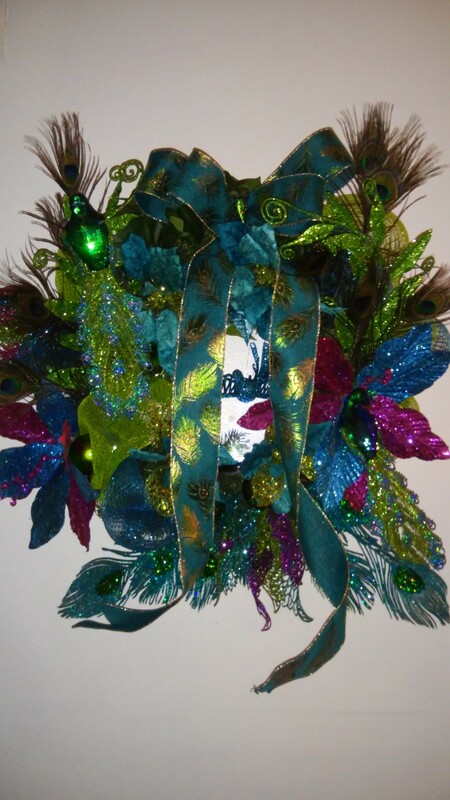 9 feet in length $149.00 to $199 including shipping to most destinations within the continental USA. 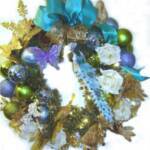 Pine 24 inch Wreath decorated in aqua and azure blues and green and pink. 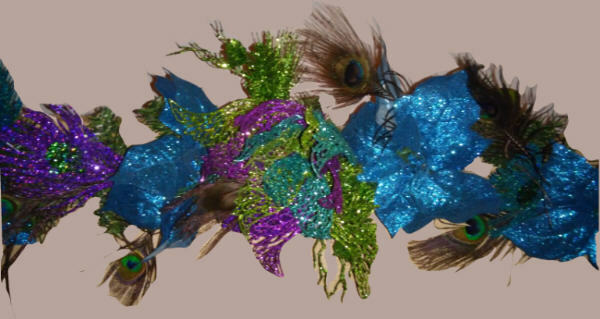 Ornaments include irridescent sequined peacocks, real peacock feathers, ball ornaments, silk flowers and bows. Wreath has electric lights unless you choose the battery powered featured above for an additional $30. Clear over-the-door hanger also included. 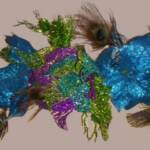 Garland 9 feet long, decorated in aqua and azure blues and green and pink. 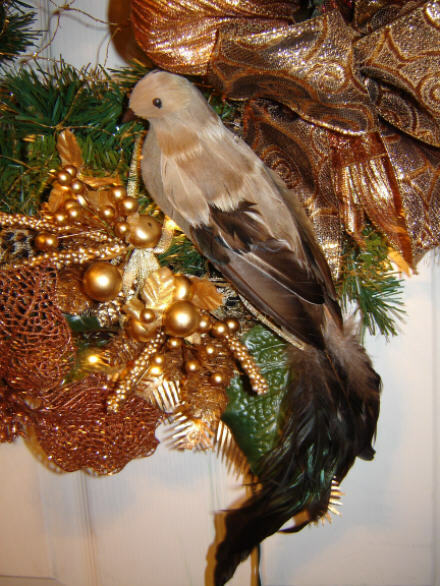 Ornaments include dozens of real peacock feathers, ball ornaments, silk flowers and ribbon and mesh material. Garland is lighted with clear electric lights. Pine Garland 9 feet long. 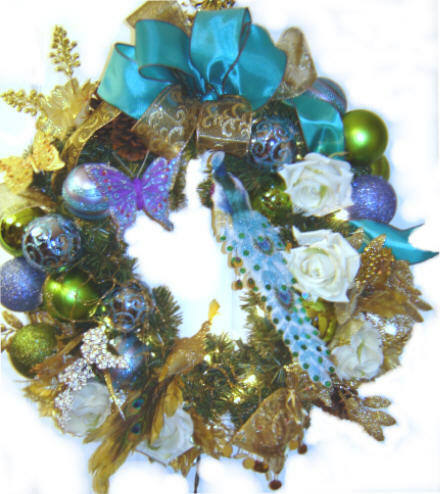 decorated with real seashells and other ornaments, ribbon, mesh, and silk floral. Garland is lighted with clear electric lights. $199.00 includes 5-7 day ground shipping (within the continental United States). $199.00 includes 5-7 day ground shipping (within the continental United States). 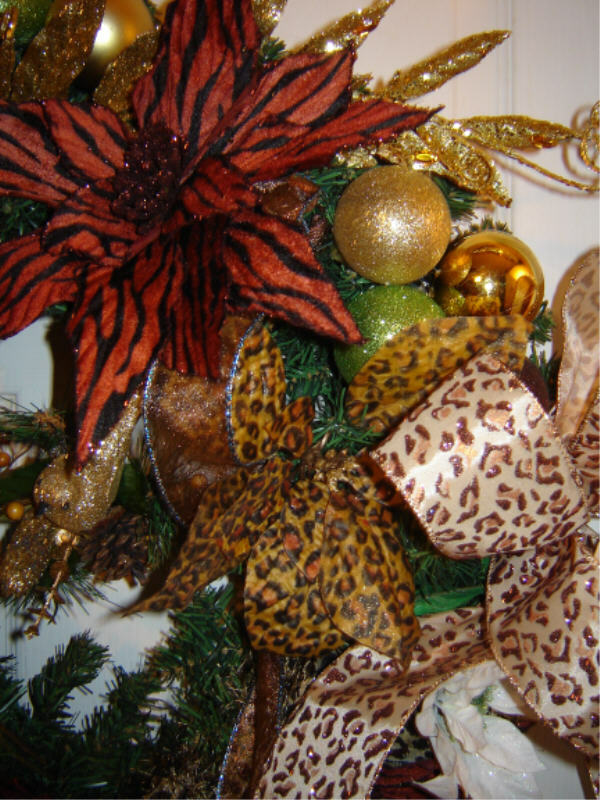 24 Inch artificial Christmas pine wreath decorated with the theme of African heritage with vibrant animal prints on the various poinsettia shaped flowers as well as the ribbons and bows and fabric. Wreath has electric lights unless you choose the battery powered feature above for an additional $30. Price $149.00 includes 5-7 day ground shipping (within the Continental United States). SELECT "FREE" at check out for no additional charge for 5-7 day ground shipping which is included in the price.